My Cosplay Corner: My Cosplans for 2016! 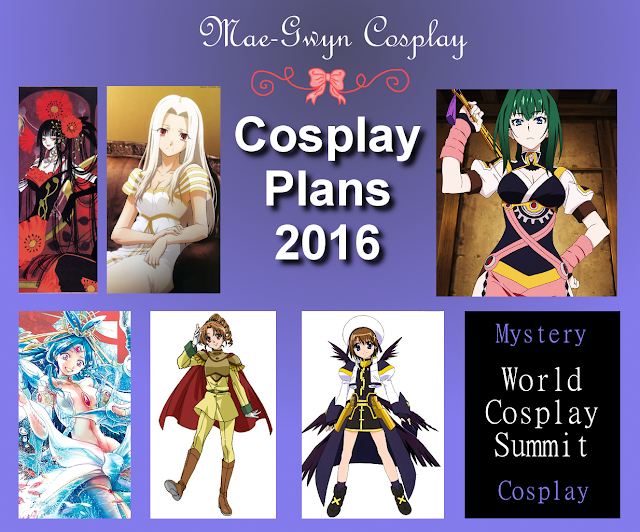 This year I decided to focus on making cosplays that are on my dream list! I started out with making Yuuko as part of a Tsubasa Reservoir Chronicles group for G-Anime. I did not expect to ever cosplay Yuuko but here I am with her on my list for the year! I have some ambitious plans that involve Irisiviel for this year; I want to make a cosplay music video where I would cover the second ending to Fate/Zero! I am almost done memorizing the song, now I just need to figure out how I am going to shoot it! Akari has been on my to-do list ever since I watched Hitsugi no Chaika a year ago. She is definitely not my typical character to portray which will make it all the more fun to do! I will hopefully get her done in time for Otakuthon this summer. I love Magi and all the wonderful costumes! I fell in love with Kougyoku's djinn equip design and I knew that I had to make it at some point. Well that point will happen this year, and I might even get to have my boyfriend, Corey, join me as Judar!! Captain Milk is from a really unknown anime called The Legend of the Legendary Heroes. I mostly want to cosplay her because of her name, after all I do come from a dairy farm! In all seriousness though, she is such a cute character and I think this will be a super comfy costume to have. Hayate is yet another magical girl cosplay on my list! I love magical girls so much, I need to make a new one every year! I really want to try and tackle her design because it has everything; wings, props, armour, and sewing! Bandit Spurs and I have decided to enter in the World Cosplay Summit Canadian Preliminaries. Our costumes and skit idea are a secret for the time being but let me tell you, we are going for the win! Wish us luck! And who knows, maybe I'll even add other costumes to this list!